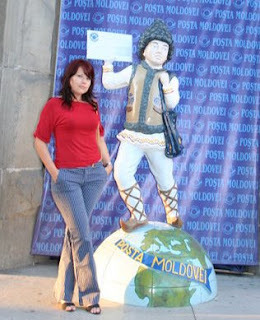 The last few days we went to a business trip to Chisinau (Moldavia's capital) and Iasi (a town in the north of Romania). Chisinau was somehow different than i expected it to be. Lots of parks, large streets and a general relaxed atmosphere. First night, after checking in at the hotel, we took a couple of hours to walk and see everything we could from central Chisinau. The Puskin park was charming, with lots of statues everywhere, and the central street full of shops. We stayed at Codru, a hotel right across the big park, and the apartment was something spectacular. A huge living and dining room, with classic furniture and a big sleeping room with jacuzzi and sauna in the bathroom. So i could not resist to organize a small "photo shooting" near the white columns or at the desk that was used even by Mikhail Gorbachev, the former Soviet President, when staying in the same apartment at that hotel. Iasi was exactly as i remembered it from my childhood (i used to stay there, at my grandparents, during summer holiday). We did a small tour of monasteries and interesting churches, and we ate at Casa Bilius, a fancy restaurant near the Bothanical garden.